Texas Review Press, 9781680031843, 96pp. 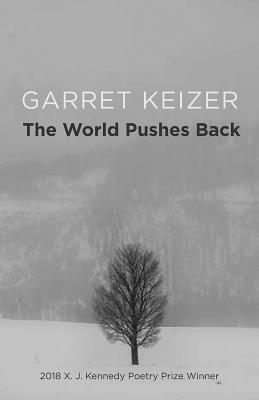 The World Pushes Back, Garret Keizer’s first book of poetry, is the winner of the 2018 X. J. Kennedy Poetry Prize. The poems are mostly lyrical, often personal, and always accessible. They have appeared in a number of venues, including Agni, Antioch Review, Best American Poetry, Harvard Review, The Hudson Review, Image, The New Yorker, Ploughshares, Southwest Review, and The Texas Review, among others. GARRET KEIZER is a contributing editor of Harper’s Magazine and the author of eight books of prose, the most recent of which are Getting Schooled (2014), Privacy (2012), and The Unwanted Sound of Everything We Want (2010). His poems, essays, and short stories have appeared in AGNI, The Antioch Review, The Hudson Review, Lapham’s Quarterly, Michigan Quarterly Review, The New Yorker, and Virginia Quarterly Review, among others. He lives with his wife in northeastern Vermont. I have waited for a book of poems like The World Pushes Back, one that honors our “quiet laboring,” one that pays off on a promise of seeing deeper into the quotidian, of managing the human web. Keizer does more than catalog the spells and bouquets of living now; he is a passionate witness to a remarkable life made holy by his spacious intellect and adventures into song.